At Paxmal, the peace monument built by Karl Bickel, walls flanking the entryway show man as he lives at left, and as he reaches his spiritual destiny at night. The elderly couple inside the foyer are clearly the same older couple pictured on Switzerland's 10-franc stamp, having celebrated peace by enjoying long, caring and productive lives together. 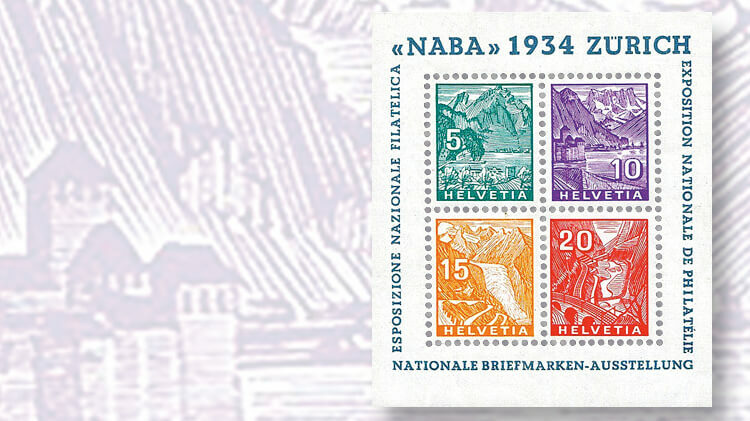 Basel artist Niklaus Stoecklin designed the lower denominations in Switzerland’s 1945 Peace set, 5-centime to 40c Numeral stamps in which the Latin “Pax Hominibus Bonae Voluntatis” (Peace, goodwill toward men) frames the stamp. The design process for the 5-franc stamp yielded an early imperf black proof showing the clasped hands of an elderly person, which also appears on the issued stamp printed in brown lake, and is part of the mosaic of the elderly woman installed by Bickel at Paxmal, the monument to Peace that he built over a 25-year period near Walenstadtberg. An imperf essay in black proof form of the 10-franc high value of the Peace set at first appears to show an elderly woman with her head flipped from the finished design in rose violet, but in fact the shading of her neck is distinctively different in the two portraits. Aldo Patocchi of Lugano designed the middle denominations in the 1945 Peace set, displaying symbols of peace in the left foreground superimposed on photographic backgrounds. The symbols include an olive branch, key to the door of peace, horn of plenty, and a dove. The 2fr (pictured in the next illustration) shows a spade turning the soil as flowers bloom. Issued in May 1945, panes of the 5-centime to 2-franc Peace stamps have labels in the selvage alternating in Switzerland’s official languages noting that the stamps were only good for 12 months after the armistice took place. The 2fr stamp is shown with the Italian inscription, “Valevoli 1 anno / dall’armistizio” (Valid 1 year / from the armistice). Karl Bickel, whose name appears before the lower frameline, designed the three top denominations of the 1945 Peace set. Here is the black proof of an early essay for the 3-franc stamp along with an imperforate essay in red approaching the issued design. The green, perforated stamp amid a field of crocuses is the issued commemorative. Karl Bickel designed both the 3-franc Peace and 60-centime William Tell stamps that frank this 1945 registered airmail cover sent from the Venezuelan legation in Bern, Switzerland, back to Caracas. Though the two stamp designs may seem contradictory, it was Switzerland’s citizen army of modern William Tells that enabled it to enforce its neutrality and preserve peace through the 20th century. In 1923, the Swiss PTT took note of gifted artist Karl Bickel and commissioned him to design some of that nation’s first airmail stamps, including this 15-centime brown-red and apple green Aircraft stamp. In 1917, Swiss postal authorities invited 10 prominent artists to submit designs for stamps to mark the end of World War I. The three Peace designs judged best were issued as stamps on Aug. 1, 1919. In 1917, Swiss postal authorities invited 10 prominent artists to submit designs for stamps to mark the end of World War I. The three Peace designs judged best were issued as stamps on Aug. 1, 1919. Last month we met outstanding Swiss stamp engraver Karl Bickel and his beautiful Landscape definitives of 1936-48. In the course of preparing that article, I came across another Swiss stamp set in which Bickel had a vital role — a set that seemed especially suited to this time of year when so many of us give thanks and pause to consider the value of human harmony and cooperation. It’s also a great story, in a season that has so many of them. To begin, you need to know a bit more about Bickel, who was born in Zurich in 1886, lost his father when he was 4, and was raised by his mother, who later remarried. When he was 14, young Bickel apprenticed with a graphic-arts firm designing picture postcards. He swiftly rose to work as the technical head at a second firm, and by 1909 he held his first art exhibition in Zurich. Brilliant but restless, Bickel cared deeply about his craft. The greatest perquisite of his early success was three months he took each year to practice and study, especially the human form and the Alpine landscapes of his homeland. After opening his own commercial studio, which did a brisk business, he left it behind in 1912 on an extended visit to Italy, studying Michelangelo and learning to sculpt in marble. Early in 1913, he caught and barely survived tuberculosis, spending more than a year in northeastern Switzerland recuperating at a sanatorium in Walenstadtberg. Bickel’s near-death experience at age 27 made him more thoughtful and reflective about what was important in art and life. 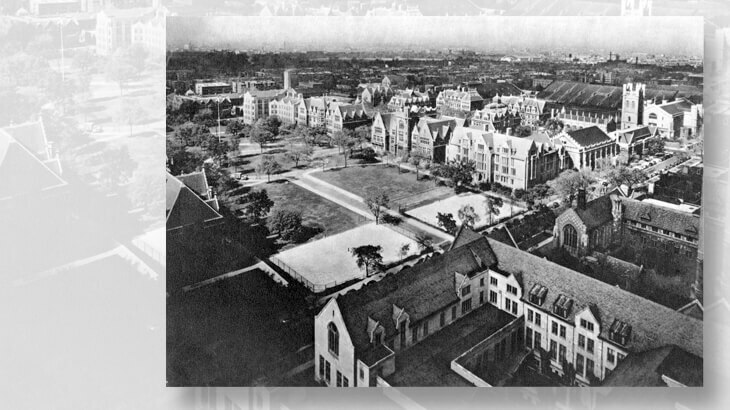 The coming of World War I focused him further still. Protected by its natural mountain fortress and a well-trained and disciplined citizen army, neutral Switzerland had a unique position in Europe. It was well aware of the “war to end all wars” that raged around its borders, but also able to contemplate its well-earned good fortune in not having to share in the carnage. The engaging story of the Swiss Landscapes definitive stamps: Fred Baumann dives deep into why these Swiss definitives are so special to world stamp collectors. Well before the fighting ended in November 1918, Swiss postal authorities had invited submissions from 10 prominent artists for stamps to commemorate the return of peace to Europe. Of these, essays by three were selected, and the stamps were issued Aug. 1, 1919 (Scott 190-192). The 7½-centime denomination pictures opposing soldiers shaking hands with mutual respect on the last battlefield. The 10c stamp shows a female allegory of Peace extending the symbolic olive branch, while the 15c stamp pictures an exhausted combatant, head bandaged and sword shattered, reclining at the end of hostilities. Beginning after his mother’s death in 1924, Bickel would invest much of his free time, wealth, and imagination for the next 25 years of his life building Paxmal, an intensely personal monument to that vision in the mountain splendor where he had regained his health. As for the Swiss PTT (postal, telegraph and telephone service), it had already taken notice of the gifted artist. In 1923, it commissioned him to design some of the nation’s first airmail stamps, including the 15c brown-red and apple green stamp (Scott 3). Bickel’s modernistic designs were criticized by those who preferred more conventional stamps, but the post office was impressed enough to offer Bickel much more work in years to come. Stamp design accounted for most of his income through the 1930s. When World War II ended in 1945, the Swiss PTT issued a much larger set of stamps to commemorate that historic event (Scott 293-305), but again utilized the services of three different artists. The theme was profoundly biblical, adapted from the story of the Nativity as told in the Gospel of Luke 2:14, in which the angels celebrating the birth of Jesus cry “Pax Hominibus Bonae Voluntatis” (Peace, good will toward men). Basel artist Niklaus Stoecklin was responsible for the lower denominations in the 1945 Peace set. These included 5c to 40c Numerals (Scott 293-297) in which the text frames the stamp, as well as a 5c+10c Red Cross semipostal sold at the same time (B145). The semipostal features a numeral design similar to that of the postage stamps, with the addition of a red cross in the upper left above the “5” and a “+10” in red in the lower left. Scott does not regard this semipostal as part of the Peace issue. Aldo Patocchi of Lugano designed the middle values in the set. These larger stamps have the appearance of horizontally formatted commemoratives. Patocchi’s designs combine symbols of peace in the left foreground with backgrounds based on photographs by Hans Steiner. The symbols include an olive branch on the 50c (Scott 298), the key to the door of peace on the 60c (299), an overflowing horn of plenty on the 80c (300), a dove on the 1 franc (301), and a spade turning up Earth as flowers bloom on the 2fr (302). The stamps were issued in May 1945. An unusual aspect of them is that panes of the 5c to 2fr denominations have labels in the selvage alternating in Switzerland’s official languages (German, Italian and French) noting that the stamps were only good for one year after the armistice took place. The 2fr stamp is shown nearby with the Italian inscription, “Valevoli 1 anno / dall’armistizio” (Valid 1 year / from the armistice). I have seen covers with these stamps used throughout May 1946, but not beyond, although I’m sure some must exist. Bickel designed the 3fr, 5fr, and 10fr high denominations of the 1945 Peace set, which differ from the rest. They are printed on yellow granite paper, with many colored silk fibers in the paper giving it a distinctive appearance. I do not know if their period of use differed from the lower denominations, but there were no instructional inscriptions in the selvage of these stamps. Nearby is the black proof of an early essay for the 3fr stamp along with an imperforate essay in red approaching the design of the issued stamp. The green, perforated stamp amid a field of crocuses is the issued commemorative (Scott 303). Bickel’s surname in capital letters is centered along the bottom margin in all three of his designs. An early, imperforate black proof of the 5fr design shows the clasped hands of an elderly person, which also appear on the issued stamp printed in brown lake (Scott 304). An imperf essay in black proof form of the 10fr high value of the set at first appears to show an elderly woman with her head flipped from the finished design in rose violet (Scott 305), but in fact the shading of her neck is distinctively different in the two portraits. A look at images from Bickel’s Paxmal monument in the mountains shows where he got much of his inspiration. Note the “PAX” inscription on the temple, and the mosaic portraits of the elderly couple cropped from the main alcove at the temple that seem to almost mirror the 10fr stamp. What impressed me about Bickel’s Peace stamps was the unusual imagery he employed, but I realized that’s at least in part due to the unique perspective the Swiss would have had toward a global conflict in which they did not take part. Like many families on this continent, mine has had members who served in almost every conflict since the Civil War. Some did not come back, and I am named for one of them, killed two months before these stamps were issued. I think that Bickel had it right. What’s best about peace isn’t swords beaten into plowshares or doves with olive branches. What’s best is the priceless gift most of my generation has received: The chance to grow up, mature and grow old with someone you love. It’s what my uncle would have wanted, I’m quite sure. Watching two world wars pass by your door can teach nations such a lesson. The 15-gram cover shown here is more postscript than postal history, sent by registered airmail Oct. 30, 1945, from the Venezuelan legation in Bern, Switzerland, to Caracas. It is franked with two of Bickel’s stamps, the 3fr Field of Crocus Peace stamp and a 60c definitive picturing William Tell, crossbow at the ready, with an arm raised as if to stop an assailant (Scott 271). Some people might regard the two stamps as contradictory, but Switzerland itself demonstrates that in fact they are not only complimentary, but instructive. Along with Bible verses, William Tell knew another Latin proverb, as did the 20th-century Swiss who successfully sealed their frontiers against European bloodshed, “Si vis pacem, para bellum” (If you want peace, prepare for war). Bickel engraved his last stamp in the 1960s, but lived to the ripe old age of 96. If you travel to Walenstadtberg, you can visit his museum nearby. In fact, if you time your arrival to meet the Swiss postal bus, it will take you to a curve in the road where a trying hike up more than 1,200 feet of mountain will deliver you to Paxmal, Bickel’s classic-style monument to peace and humanity. Which stamps, sets or series make you glad to be a collector? Which ones do you turn to first when you meet with other collectors, or have occupied your interest and fascination for years? If you have one or more candidates, please write to me in care of Linn’s Stamp News, or email me at fwtb53@gmail.com.